We interrupt this features blog just as Abby and I were interrupted today—by an enormous moose. No kidding. If you don’t know already, LibraryThing is located in Maine. But we’re on the East End of Portland, the most densely populated part of the state. I for one don’t ski, hike, kayak, snowshoe or climb mountains. Until now, my “Maine experience” has been limited to crab rolls and one day of blueberry picking. Abby, a resident of downtown Boston, is even less a Mainer, and since she works 16-hour days, she’s seen almost nothing of the state. It went down like this. In the morning, Abby and I heard queer trumpeting noises; my money was on truck brakes. When my wife went out there were cop cars at both ends of our street and a crowd of cops and media about a block away. When I tried to investigate the commotion, I was sternly ordered to get back inside. I assumed a grisly accident or maybe a criminal, locked in his house and holding the police at bay with a gun. Ten minutes later I saw a cruiser moving slowly down the street, and went over to the window with Abby. And there, across the street, in the neighbor’s driveway, was a huge bull moose. Our spirits went up and down over the next hour or so. The moose was lying down, and we noticed something was wrong with its head. We figured out he had broken an antler. But he was alive, and although Maine game wardens appeared with an enormous–and not visibly pneumatic–gun, they just shot a dart into it. Alas, it turns out the dart was loaded with a fatal dose of tranquilizer, so over the next hour we watched the moose die. The game wardens were dignified about it, and the death wasn’t violent, but it was still terrible to watch. It was a magnficent creature. When a crane loaded his body onto a truck, his body was all splayed out. He was huge. Once the moose was almost dead, we found out what happened (with video). It turns out it had made its way into the city and, together with another moose, put on an early morning show near Back Cove. Then, going up Munjoy Hill, it was hit by a tow-truck. According to the police it was “badly injured,” although I remain unconvinced. News footage shows a broken antler, but it looked like it was moving just fine. 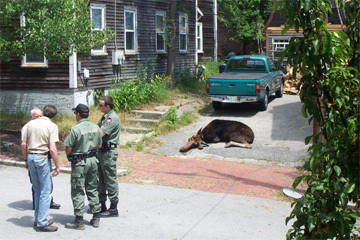 According to a local informant most moose who wander into the city end up getting put down one way or the other. Besides the danger to cars, moose not infrequently trample people, particularly those who think they’re safe to approach. Moose aren’t endangered or anything. So that’s the LibraryThing moose story. Tomorrow Tim and Abby will be eaten by lobsters.